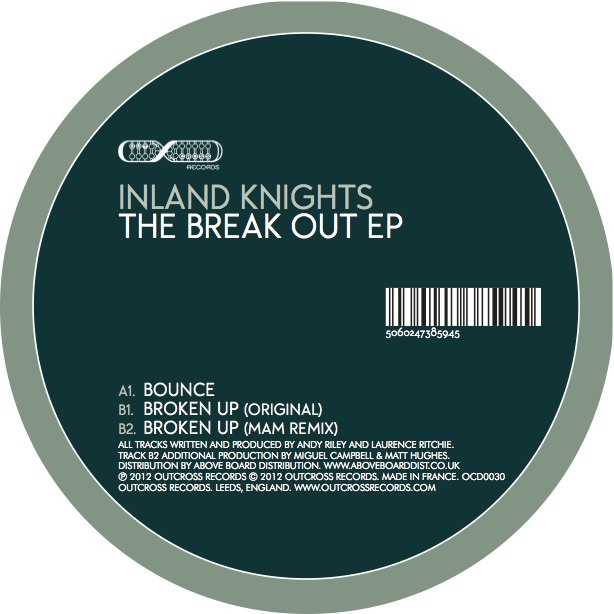 Inland Knights' new EP focuses on the kind of funky tech influenced house they've made their name with. It's an unfunny release so you'll probably either like it or you won't. The EP opens with 'Bounce', a jerky, stuttering minimal track. Trademark silky pads and a distorted electronic bass provide the funk here whilst a cut up hip-house vocal delivers a little cheeky attitude. The track's drum track is focused and tight, giving the whole track a close, intimate sound. On side two 'Broken Up' is a little less immediate, a loser percussion line leading in an acid bass line. The whole thing is a feels like a tease for the heavily filtered sample dropped in the bridge though. With elements of brass and plenty of disco sass it's another back room track for electro influenced sets wanting to show off a little disco smarts. No bad thing in my book but it probably won't change your world, but it might make your weekend. Miguel Campbell & Matt Hughes close out the release, turning in a remix of 'Broken Up' as MAM, an act familiar with their disco-house sound. It doesn't have the acid bass and minimal influence of the original and instead takes a more straight-up route. It's fine, but a little unremarkable - the tighter original the stronger version.